If you are serious about marketing your business online, you need reliable web hosting. You may have the best website and the most effective online marketing campaign, but if you skimp on website hosting, you can bury your business. Your website will get hacked, your server will go down in the middle of your product launch or your hosting “neighbour” will hi-jack your server resources (memory, processing power or bandwidth) and your hosting account will be shut down. We have evaluated a number of hosting providers and were horrified to find out that even some of the biggest hosting companies have very poor ratings with the Better Business Bureau. We were even more surprised when we read some of the horror stories about their service levels published on webmaster forums. After long and agonising research, we have finally selected four companies (two in the UK, one in Ireland and one in the USA), that we are proud to be affiliated with. If you are looking for a reliable web hosting company, we can wholeheartedly recommend them. If you are hosting your website on servers in one geographic location e.g Ireland, but most of your visitors come from another geographic location e.g. the US, it is very likely that your US visitors are experiencing delays (latency) in seeing your web content. See the example below. 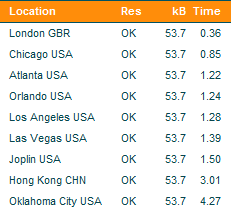 One of our websites hosted in Ireland took 0.36 seconds to load in London (UK) and over 4 seconds to load in Oklahoma City (USA). It is therefore best for most local businesses to have their website hosted on a local server. If you trade internationally and most of your traffic comes from abroad, it may be advisable that you host your website elsewhere. Beware, there are many US companies that advertise in the UK, either directly or via their resellers, without disclosing their server location. Depending on your specific marketing need, we can provide web hosting on the some of the best web servers in Ireland, UK or the USA. 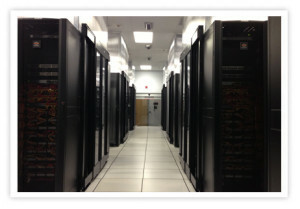 We only work with the top, professional web hosting companies that guarantee 99.99% server uptime and fast web access. You can choose any one of our six approved hosting providers, either in the UK, Ireland or the USA. Hosting additional websites on the same hosting package is permitted. Domain parking (that is storing an additional domain and re-directing traffic to the main site is free of charge). You can probably get hosting marginally cheaper when you buy it directly from the hosting company, but is it worth the hassle to save a few Euro per year? With us, you get the first line of support and some basic webmaster services. We will set up your emails, autoresponders, and redirects. We will upload your website and take care of the domain, script and database transfers. We will also monitor traffic to your website and ensure that you have sufficient bandwidth. In case there is a problem, we will spend time on the phone to the web server support staff, so you don’t have to. The hosting price also includes weekly backups of your website in case something goes wrong (we do it independently of the hosting company). We can also offer you an option to do your own additional backups if you need to. Look at the impressive features of our premium business hosting packages. The package that you choose can be upgraded or downgraded through your account at any time. We recommend that you choose a package that meets or exceeds your existing needs, so that you’ll have room to grow. Should your needs change, we can easily move your website to another host, without any noticeable disruption to your service.